Mixed School – This school is in a very good state of organisation and discipline and has passed a highly creditable examination in the elementary subjects, and in English and Geography, in spite of hindrances during the year. The Singing by ear and note was very good. The Needlework was, on the whole, good. In January 1924 Miss Jessie H. Jenkins retired after 45 years as Infants’ Mistress. 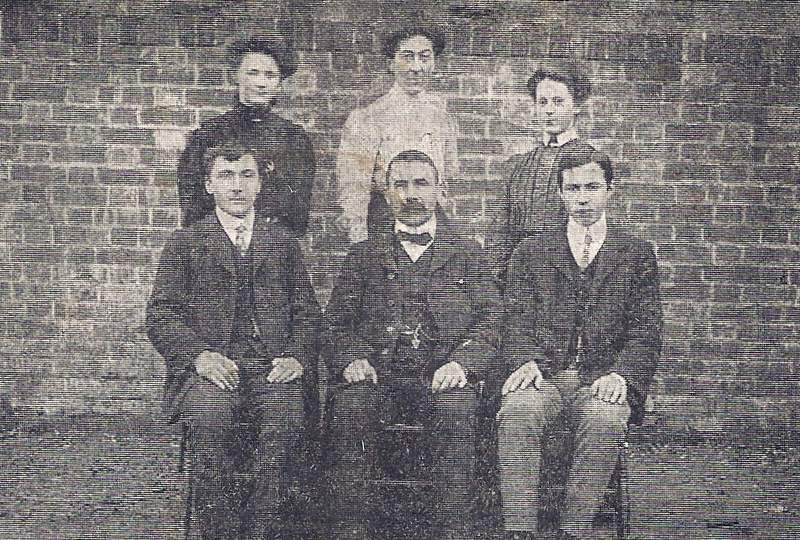 On 19th February 1931 Llewelyn Davies retired after 36 years as Headmaster. In 1934-57 Rowland Peregrine was the Headmaster. In 1946 Rowland Ll. Peregrine, became the Mayor of Cardigan. By 1st July 1949 the school was being referred to as St. Mary’s Modern Secondary School. 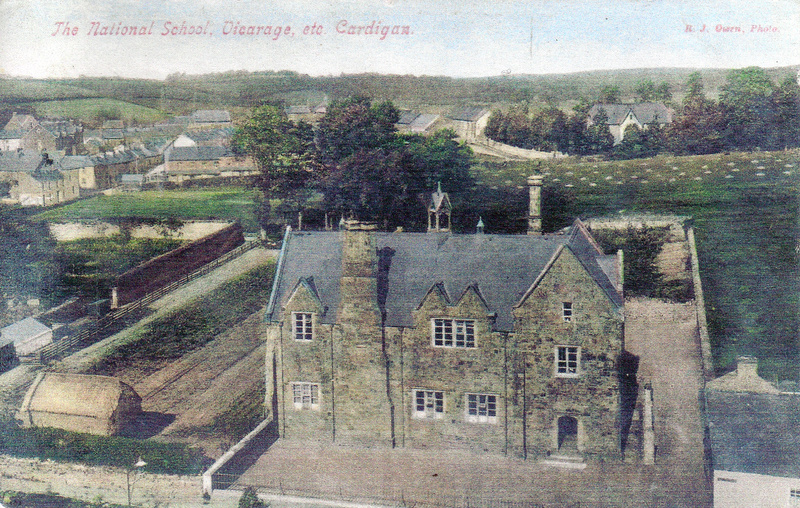 In 1959 the school was amalgamated with Cardigan Grammar School and the pupils moved to the other site. It remained in use as an annexe of Cardigan F. E. College Art Department. The building was advertised for sale in July 2001. Repairs were under way in March 2009. The upper floor was advertised to let in November 2010. 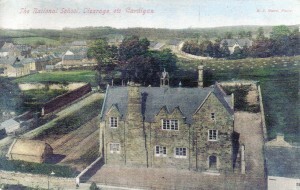 1847-8 former National School, with alterations of 1901 and 1907, possibly further altered c1960. 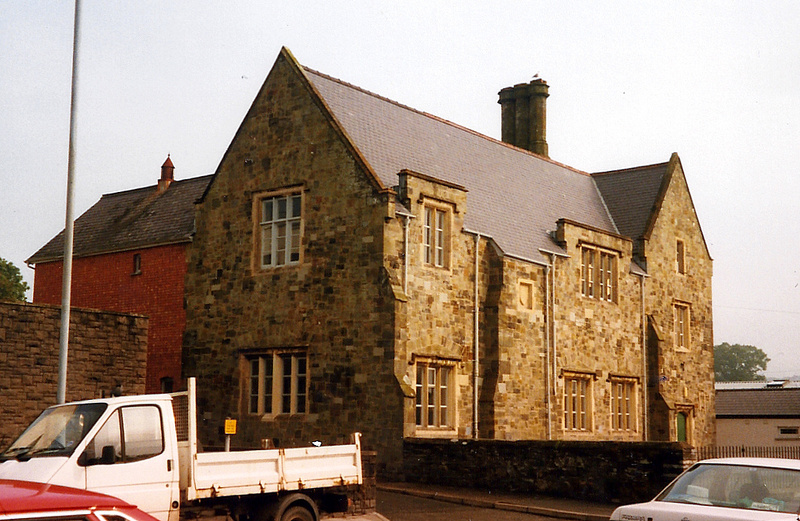 Snecked stone rectangular 2- storey building, gable ended, with sandstone mullioned windows and door and pitched slate roof with red ridge tiles and coped gables. Façade has 3 irregular bays. To left at angle is stepped shouldered buttress, then tripartite mullioned window to ground floor with raised rectangular head and cut stone voussoirs over. Upper storey has bipartite mullioned window with rectangular hood, eaves breaking, beneath short raised coped parapet. There was formerly a miniature gablet here. To right is shouldered-sided projection, formerly tall stone chimney with three rounded stacks to upper section, but truncated at eaves level and roofed over. Blank sandstone shield within square recess at upper storey level. To right of this, ground floor pair of tripartite mullioned windows with 4-pane similar window to first floor, again with eaves-breaking parapet, formerly double gablet. Shouldered butress to right. Beyond this, right, is full height gable ended section with Gothic pointed-arched ground floor entrance with boarded timber door, sandstone dressings and rectangular raised hood. Stair light above – bipartite mullion and single narrow light with similar dressings to gable. Left end has quadripartite mullioned window in the same manner, with wider centre post, and renewed tripartite mullioned window to first floor. To rear is 2-storey red brick extension with pitched slated roof and gabled to rear. East side has small rectangular flat headed 2-pane light with stone lintel to ground floor left, quadripartite mullioned with voussoirs over to left of centre, raised plinth, and boarded timber door to right, matching that to façade. First floor has tripartite mullion to right and bipartite to raised attic gablet with raised coping and slate roof. Rear has gable ended range to left with 2nd floor and attic small lights, then, set back, main range with pair of tripartite mullions to ground floor and quadripartite to first floor, eaves-breaking and coped, matching façade opening. Roof apex formerly had, to centre, small bell turret with domed roof on narrow cast iron columns. Those Were The Days Vol. II, Donald Davies 1992. 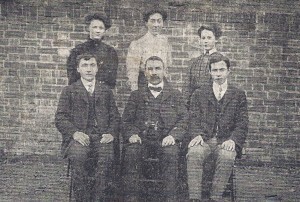 I don’t recall a photo of St. Dogmaels School quite that early, so I would be very interested to see that. Lots of children used to walk remarkable distances through fields and along footpaths in the days before the school bus.